When the twelve-year-old Franz Liszt (1811–1886) arrived in Paris in 1823 with his parents, he had already astounded audiences with his extraordinary musical gifts in his native Hungary as well as in Germany and, most notably, Vienna, where Beethoven anointed him with a kiss on the forehead. Not long after his arrival in Paris, he would also amaze the sophisticated cultural community of the City of Light. Through nearly fifty manuscripts, first editions, letters, and related materials drawn almost entirely from the Morgan's collections, the exhibition Liszt in Paris: Enduring Encounters celebrates the art and the diverse and fertile artistic world of the virtuoso pianist-composer. Despite his fame and talent, when Liszt arrived in Paris, he was refused admittance to the Conservatoire because of a recent ruling banning foreigners. Nonetheless, Paris remained Liszt's home base for many years. By the 1830s, Liszt was a fixture both on the concert stage and in Paris's artistic and aristocratic circles. He came into contact with the leading novelists, poets, painters, and musicians of the day, among them Eugène Delacroix (1798–1863), Alexandre Dumas (1802–1870), Heinrich Heine (1797–1856), Victor Hugo (1802–1885), Felix Mendelssohn (1809–1847), Giacomo Meyerbeer (1791–1864), Gioacchino Rossini (1792–1868), and Ary Scheffer (1795–1858). The show begins by introducing Franz Liszt as the prodigy who at an early age was already composing as well as concertizing. The section includes an edition of his first published work, written at the age of eleven, and a playbill for a concert at which Liszt performed a "New Fantasia on Piano-Forte," at the Theatre Royal, Covent Garden, in London at the age of fifteen. The viewer is then introduced to the maturing Liszt and his encounters with fellow musicians Berlioz, Chopin, Paganini, and later Wagner. Liszt met Hector Berlioz (1803–1869) on December 4, 1830, the eve of the premiere of the Frenchman's Symphonie Fantastique. Liszt's transcription (published in 1834) and performances helped popularize the piece, which was not published in its original form until 1845. Both an album leaf in Berlioz's hand containing the waltz theme from the second movement and an early edition of the orchestral score are on view. Berlioz, whose Le Roi de Thulé (the text taken from Goethe's Faust) was later incorporated into his Damnation de Faust, shared with Liszt his love of Goethe's work and dedicated the Damnation to him. Liszt reciprocated by dedicating his Faust Symphony to Berlioz. The autograph manuscript of Le Roi de Thulé and the piano-vocal score of La Damnation de Faust are joined by Delacroix's drawing Mephistopheles Appears Before Faust. Also highlighted in this section is the autograph manuscript of Liszt's First Piano Concerto, a work that received its premiere in 1855 in Weimar (where Liszt had moved after being appointed director of court music) with Liszt as soloist and Berlioz conducting. Liszt met Frédéric Chopin (1810–1849) shortly after the latter's arrival in Paris in September 1831 and attended his Paris debut at the Salle Pleyel on February 26, 1832. Displayed along with the playbill for this concert are the first piano solo edition of Chopin's Piano Concerto, op. 11, and the autograph manuscript of his "Là ci darem la mano" variations, both pieces among those that Chopin performed at his debut. Their friendship also led Chopin to dedicate his "Études," op. 10 to his fellow pianist. Both the first French edition of the complete Opus 10, as well as the autograph manuscript of Opus 10, no. 3, are featured in the exhibition along with Liszt's 1852 appreciation and biography of Chopin. In Paris Liszt heard the violinist Nicolò Paganini (1782–1840) for the first time in 1832. Impressed by Paganini's virtuoso technique, Liszt immediately set about translating the violinist's exceptional artistry for the piano. The result was the fiendishly difficult Grande Fantaisie de bravoure sur "La Clochette" de Paganini. Paganini's 24 Capricci was another point of departure, forming the basis for Liszt's Grandes études de Paganini. All three scores are featured in the exhibition. In 1841 at the Paris Conservatoire, Liszt performed Beethoven's Emperor Concerto with Berlioz conducting. In attendance was Richard Wagner (1813–1883), who reviewed the performance for the Dresden Abend-Zeitung. Liszt was to become one of Wagner's staunchest supporters (and eventually his father-in-law). He premiered Wagner's opera Lohengrin at Weimar in 1850. After Wagner's death in February 1883, Liszt composed Am Grabe Richard Wagners on May 22, which would have been Wagner's seventieth birthday. Liszt's essay on Lohengrin, the first edition of the opera's libretto, and the autograph manuscript of Am Grabe Richard Wagners are also on view. 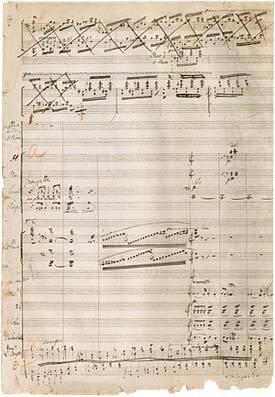 In addition, the autograph manuscript of Schubert's Erlkönig (text by Goethe) is displayed alongside Liszt's published transcription of the song for piano. Liszt in Paris: Enduring Encounters is organized by Frances Barulich, Mary Flagler Cary Curator of Music Manuscripts and Printed Music, the Morgan Library & Museum. This exhibition is supported through the generosity of Mr. and Mrs. Lester S. Morse, Jr., and Patricia and John Forelle. Franz Liszt (1811–1886), Piano Concerto No. 1 in E-flat Major. Robert Owen Lehman Collection, on deposit.